A few weeks ago, I was chatting to a friend in the offices of the Photography and the Archive Research Centre. During a pause in our conversation, my gaze fell down towards the floor where it was met by a series of posters in white wooden frames leaning against some full bookshelves. One of the posters is the one you can see in the photograph I’m using to begin this short post. Black and white and dominated by the strong diagonal force established by the 747 running at full flaps with its under carriage down – probably landing rather than taking off. 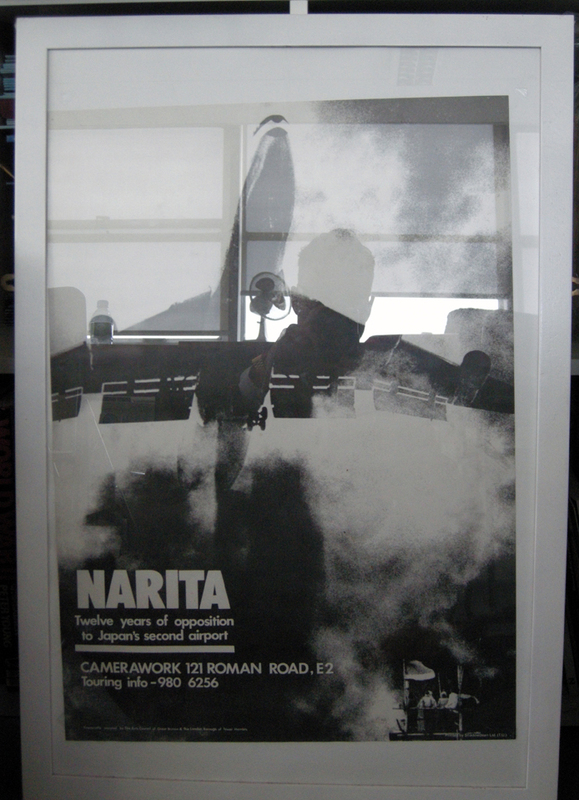 Apparently holding the tail of the descending aircraft in a graphic grip is a rising cloud of black smoke that provides a contrasting background for the text that occupies the lower left corner: “Narita: Twelve Years of Opposition to Japan’s Second Airport: Camerawork 121 Roman Road E2”. In the lower left corner of the image is a small structure – made smaller by the dominance of the plane in the visual frame – on which the outlines of a number of people can be identified. A flag straightens against the growing wind. My own image is a hasty one. Reflected in the glass, you can see me crouching to take the shot and the metal struts of the window, a water bottle superimposed above the jet’s left engine; my snap makes the frame squint at its bottom and washes out the strong contrasts of the original. Such an accidental find felt very auspicious only a matter of weeks before returning to Narita, the scene depicted in the photograph. A couple of Google searches didn’t reveal much about the exhibition advertised in the poster but did indicate that in 1981 there was what might have been a corresponding article in Issue 22 of the influential magazine Camerawork. It turned out that – at least according to their online catalogue – my local university library held a copy of this particular issue. One day during the Easter holidays my two children were coincidentally out playing with friends and I took the two hours this gave me and turned it into a visit to the library. Feeling for once like a proper academic, I found the right shelf and there was a span of issues of Camerawork bound into a blue leather folder, gold ink on the spine. The photograph in the poster, and those contained in the article, one of which adorned the cover of Issue 22, were by Takashi Hamaguchi. The photographs date from between 1968 to 1977 and draw upon different aspects of the protest: a baton charge by a phalanx of riot police, the helmet of one particular officer looming towards the camera, a silhouette of buildings reflected in its polished dome; farmers sitting down in a huddle, their conical bamboo hats joined by a student protestor with a logoed hard hat; a burning farm house surrounded by low bushes with taller trees in the background, the building looking like it had once been akin to one we saw in the Imperial Ranch Museum (described in the post “Live With The Soil”), police sprint pass the conflagration. These stunning images are contextualised through a side-bar timeline of the protests and through an extract from Jon Halliday’s book “A Political History of Japanese Capitalism”. There is also a short introductory editorial, in which the anonymous author considers Hamaguchi’s documentary images, “[t]he pictures raise questions about the nature of ‘spectacle’ and visual pleasure that must affect attempts to portray oppression and resistance. Their ‘power’ derives not only from the spectacular and direct tactics used to thwart the demonstrators. It owes much to the clarity with which this campaign crystallised the meeting of normally invisible political and social forces – the needs of a people, imperialist military interests, the stage, industrialisation and the control of the future”.